– Chang E Flying to the Moon The story of Chang E is the most widely accepted tale regarding the moon and the origin of the Mid-Autumn Festival. It is said that in ancient times, ten suns existed and the extreme heat made people’s lives very difficult. It was the hero Hou Yi, who, owing to his great strength, shot down nine of the ten suns. On hearing of this amazing feat and the hero who performed it, people came from far and wide to learn from him. Peng Meng was among these people. Later, Hou Yi married a beautiful and kind-hearted woman named Chang E and lived a happy life. One day, Hou Yi came upon Wangmu (the Queen of Heaven) on the way to meet his old friend. Wangmu presented him an elixir which, if took, would cause him to ascend immediately to heaven and become am immortal. Instead of drinking the potion himself, Hou Yi took it home and presented it to Chang E to keep. Unfortunately, Peng Meng secretly saw that. Three days later, while Hou Yi was out hunting, Peng Meng rushed into the backyard and demanded that Chang E hand over the elixir. Knowing that she could not win, she took out the elixir and swallowed it immediately. The moment she drank it, she flew out of the window and up into the sky. Chang E’s great love for her husband drew her towards the Moon, which is the nearest place to the earth on the heaven. On realising what happened to his wife, Hou Yi was so grieved that he shouted Chang E’s name to the sky. He was amazed to see a figure which looked just like his wife appeared in the Moon. He took the food liked by Chang E to an altar and offered it as a sacrifice for her. After hearing that Chang E became a goddess, folk people also offered sacrifices to Chang E to pray for peace and good luck. Since then, the custom of sacrificing to the moon has been spread among the folklore. 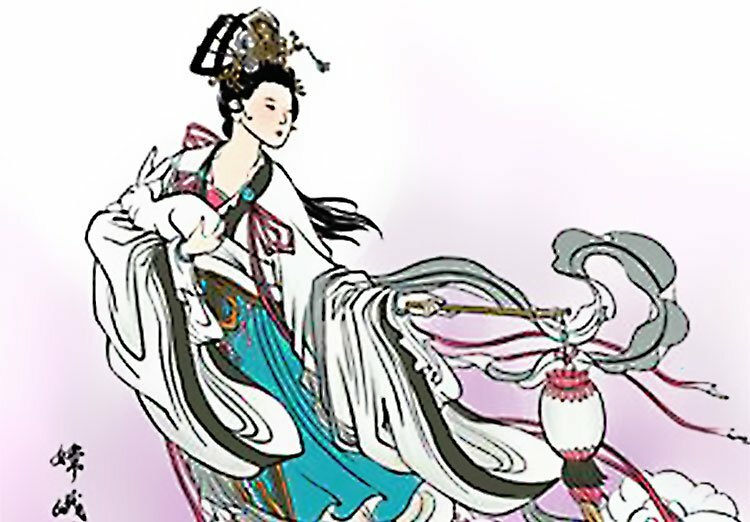 – Jade Rabbit Pounding Medicine The story goes that three immortals reincarnated themselves into three poor old people and begged food from a fox, a monkey and a rabbit. The fox and monkey both gave food to the immortals. However, the rabbit did not have any food. It then said to the immortals: “you can eat me” and jumped into the fire. The immortals were so moved by the rabbit and sent it to the moon to become an immortal jade rabbit. Ever since, the jade rabbit stayed in the Moon Palace to accompany Chang E and pounded immortal medicine for those living in the heaven. – Wu Gang Chopping Laurel Tree If look carefully at the moon in clear nights, one can see a black shadow on it. This is another fairy tale. Long time ago, there was a man from Xihe of Han Dynasty (202 BC – 220 AD) named Wu Gang. He once followed the immortals to cultivate himself and became an immortal too. However, when in the heaven, he made a mistake and was banished to the moon to chop the laurel tree. This laurel tree growing in front of the Moon Palace was very flourishing and tall. Each time Wu Gang chopped it, it grew back right up. This happened again and again and the tree was never cut down. The endless hard job was a punishment for Wu Gang. – Zhu Yuanzhang and Moon Cake Uprising In late Yuan Dynasty (1271 – 1368 AD), people in many parts of the country could not bear the cruel rule of the government and rose in revolt. Zhu Yuanzhang, founder of Ming Dynasty (1368 – 1644 AD), united the different resistance forces and wanted to organize an uprising. However, due to the narrow search by government, it was very difficult to pass messages. The counselor Liu Bowen later though out the great idea of hiding notes with “uprise on the night of August 15th” in moon cakes and had them sent to different resistance forces. The uprising turned to be very successful and Zhu was so happy that he awarded his subjects with moon cakes on the following Mid-Autumn Festival. Since then, eating moon cakes has been a custom on Mid-Autumn Festival.